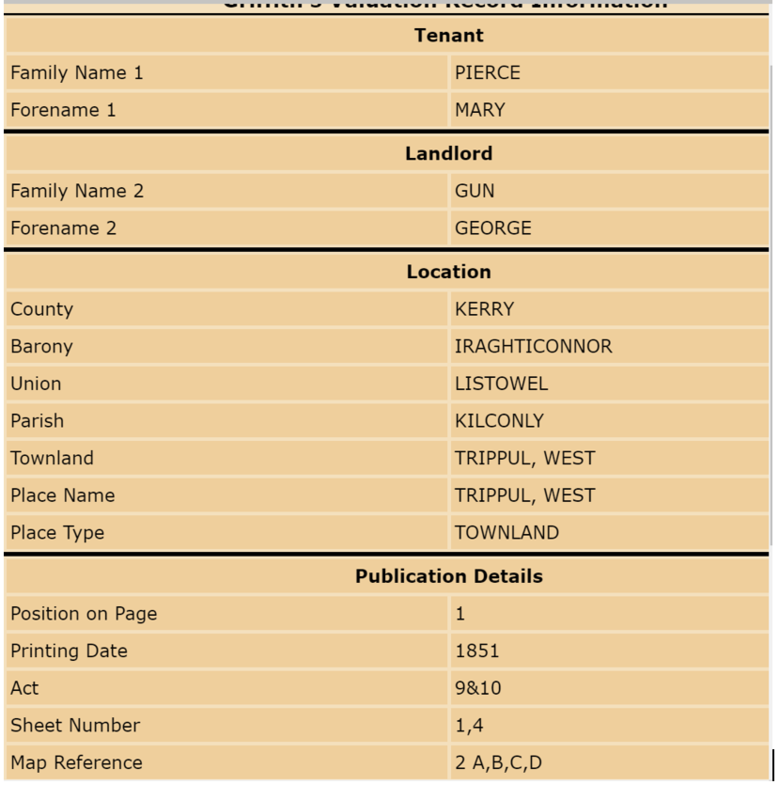 While this post is headed ‘Griffiths Valuation in Kerry’ the explantions provided here for the Pierce tenanted land, are applicable to any other Griffith’s record, in any part of Ireland. I am posting this Kerry Griffith’s Valuation explanation in reply to questions that I am often asked – to explain the different letters and figures that appear on Griffiths Valuation (AskaboutIreland,ie) In this case, I have kindly been given permission by her descendants to use the Mary Pierce record as an example. Griffiths Valuation was a survey of all property in the country to calculate the local tax rates to be paid towards the Poor Law structure. 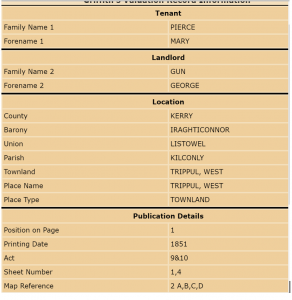 Having found Mary Pierce’s record in the Barony of Iraghticonnor, Civil Parish of Kilconly and townland of Trippul West, we can see that her Immediate Lessor was George Gun, that the original record was printed in 1851 and that the accompaning map details are Sheet 1,4, Map Referece 2A,B,C,D. The numbers and letters above refer to the Ordnance Survey Maps on this AskAboutIreland website. The maps accompanying this site are from 1880s so not entirely accurate. 1851 Maps are available on FindMyPast.ie (Griffiths Survey Maps & Plans 1847-1864). The number (2) represents the lot on the map, that Mary Pierce is renting from the ‘Immediate Lessor’ or the person to whom she is paying the rent, in this case George Gun esq. The capital Letters A, B, C and D are the sub-divisions within the lot and indicate separate parcels of property in the townland of Trippul West held by Mary Pierce. These include a House, Outoffices and land, a small amount (38 perches) was labelled ‘part mountain’. While George Gun is the Immediate Lessor and the person to whom Mary Pierce pays her rent, he may not have been the actual owner of the land. He may be sub-letteing or the ‘middleman’. In 1751, the Civil Parish of Kilconly was owned by Francis Fitzmaurice 3rd Earl of Kerry. He sold off the majority of his North Kerry estates between 1760 and 1810 with most of the Fitzmaurice anscestral land of Beale sold to William Hare, Lord Listowel. The area marked a. r. p. refer to land measurement of Acres, Roods and Perches and the valuation figures £.s.d., are pounds, shillings and pence. (12 pence in a shilling, 20 shillings in a pound). If we take the case of Lot (3), Michael Collins has two parcels of land (A & B) rented from George Gun. Michael in turn has sub-let houses (labourer’s cottages) A to Jeremiah Creed and James Quinlan and also sub-let cottages B to Honoria Glinns and Michael Corridan. These ‘houses’ would most likely be what was called ‘cabins’, very basic 4th class houses. To get more information of each occupier and more accurate mapping I would recommend also looking at FindMyPast.ie (paid site) on the Ireland Valuation Office Books site. Here you can access several different manuscript records from the Valuation Office in Ireland, which were the books prepared by the valuers and surveyors prior to the end printed result. The original records are handwritten and, as such, there may be some errors in the transcriptions due to difficulty in deciphering the original text. Checking the images will help to ensure you have the most accurate information. Here you may find a record of one or more of the following: Field Books, House Books, Quarto Books, Rent Books, Tenure Books, Survey Books. In the case of Mary Pierse described above, I found just one reference here in the Tenure Books. Above is an image from the notebook of the surveyors called a ‘Tenure Book’ where they initially took their notes. We can see that they did not have ‘Mary’ as the original name when they started. It is not possible to decipher the name that has been crossed out but as the surname Pierce has stayed the same, it may be Mary’s husband’s name initially. A female name on the tenant lists usually indicate a widow. FindMyPast Records have been provided in partnership with the National Archives of Ireland. Honoria GINNA, (GUINA) – a surname which is derived from the Irish for McKenna, Mac Cionnaith. Yes McKenna is a very difficult name to research as it was spelled in so many different ways. In North Kerry it was always known as ‘Ginna’. Anyone researching McKenna please contact me. Greg, best of luck! ‘McKenna’ is a really difficult family to search for. They were called ‘Gna’ even when I was young and that could be spelled any which way so you have to take all possibilities into account. Have you a location or date? i have already done a couple of searches for McKenna descendants in the north Kerry area.